Renault which can be considered as one of the fast-growing companies in India has launched the all new Renault Duster Explore starting at Rs 9.99 lakhs in India. The Duster Explore is a limited edition car from Renault. When it comes to the look and feel, the car has a sporty exteriors and new striking interiors, and is going to be powered by the refined 1.5 litre dCi engine that is quite tough and runs for your needs. Duster Explore has been designed keeping Indian audience in mind and is a perfect vehicle for the family get away trip or for regular office commutes. The french based auto company, Renault has kept enhancing the Duster range and the Limited Edition Duster Explore. The car follows the Duster AWD and the New Generation Duster, which has attracted over 1,30,000 plus Duster customers in India. With Duster, we created a new segment in the Indian automotive industry. Duster plays a key role in Renault’s growth plans in India. As a forward-looking company, we have kept the Duster fresh and contemporary, exceeding customer expectations and building on the legacy of India’s favourite SUV. We are confident that the Duster will continue to be the benchmark in this category, and the newly launched Limited Edition Duster Explore will further build the Duster brand in India. The Limited Edition Renault Duster Explore would be made available in 2 different variants, the Limited Edition Duster 85 PS RXL Explore and the Limited Edition Duster 110 PS RXL Explore and has been priced aggressively at Rs. 9.99 Lakh and Rs. 11.10 Lakh (ex-Delhi), respectively. 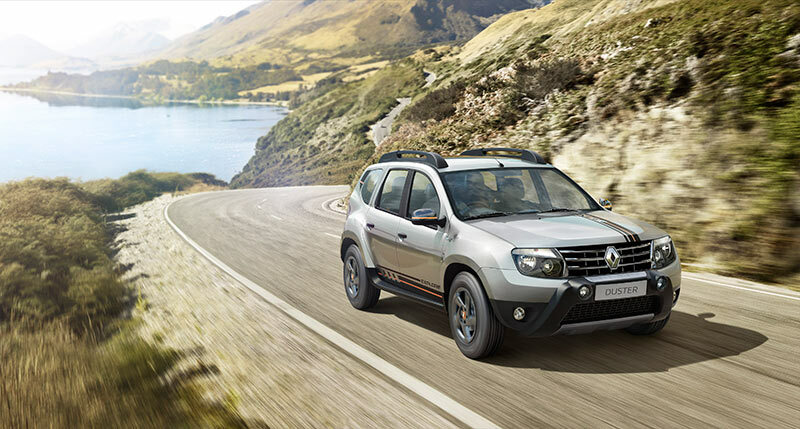 Limited Edition Renault Duster Explore has been designed to make an everlasting impression. An imposing dark chrome front grille and a skid plate reveal its SUV roots. The new racing stripes enhance its sporty, robust design. A bold front armour that houses the sharp, bright lamps sets the tone for an expedition. While the smoky double barrel headlamps and a tailgate that has a dark chrome finisher with Duster engraved on it, add to the overall style quotient. Matt black stripping on B & D pillars and sporty decals on the hood and sides which ensure it makes a strong impression on the road. And the wide, dark anthracite alloy wheels with new ‘Nouveau Orange’ highlight in the centre exemplify its spirit of adventure. The combination enhances Duster’s on road presence and road dominance. Duster Explore is a rare blend of ergonomics and elegance. 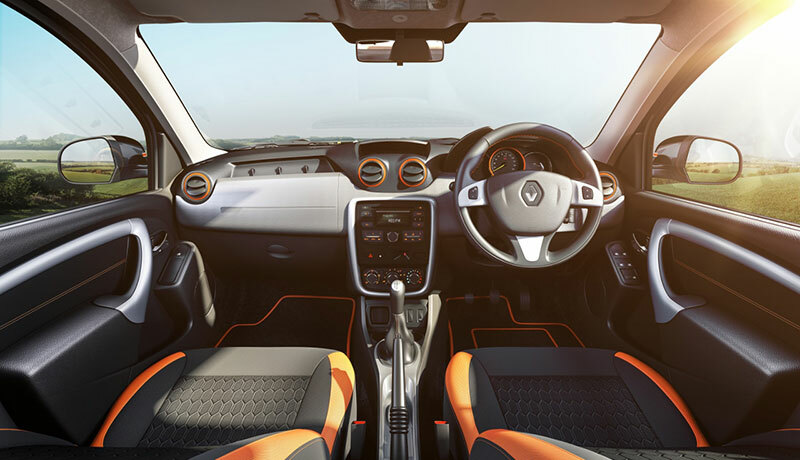 Even the interiors of the Duster Explore are plush and ooze opulence and represent a bigger and more sophisticated cabin. 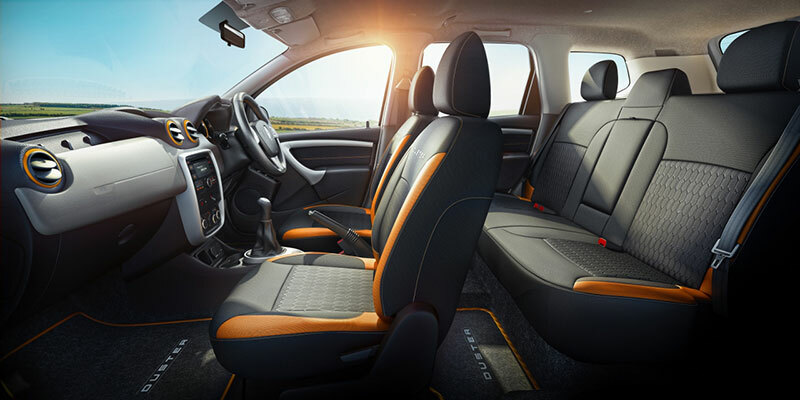 The interiors of the Duster have dawned a new snazzier look and feel with chrome inside door handles, orange door trim fabric inserts, sporty ‘Nouveau Orange’ theme seat fabric upholstery, gear shift bellow with orange stitch marks, chrome knob for parking breaks, new orange outlines on the air conditioning vents, leather steering wheel with orange stitch marks, an orange anodized instrument cluster, new floor mats with orange outline and Duster branding. The Limited Edition Duster Explore features segment leading features like Eco mode, Gearshift indicator and Cruise control with speed limiter, amongst others. The Limited Edition Duster Explore is going to be powered by the renowned 1.5 litre dCi engine and offers a choice of 2 power outputs, 110 PS and 85 PS. The powerful 110 PS version has a 6 speed manual transmission with gear ratios perfectly matched to the engine’s output. As a result, everyday drives in start-and-stop city conditions remain pleasurable. At the same time, it ensures an ability to cruise at high speeds on the highways. That too, with a fuel efficiency of 19.64 kmpl (ARAI). The 85 PS version features a 5-speed manual transmission that gives you the best drive in stop-and-go traffic conditions and delivers a best-in-class fuel efficiency of 19.87 kmpl (ARAI). Renault is also looking to significantly increase its presence across India. Together with its product offensive strategy that has been strategically planned to meet this objective, there is also a firm plan to aggressively expand the dealership footprint, by doubling the sales and service outlets by the end of next year.